Our team of expert Eastern Suburbs Locksmiths are not only limited to one suburb of Sydney. We are able to come to you wherever you are. Our mobile locksmith service covers the Eastern Suburbs of Sydney and most surrounding areas. No matter if you are located in Surry Hills, Paddingon, Bondi, Randwick, Maroubra, or Mascot. Our Eastern Suburbs locksmiths are never far away. We can often get to your location within 30-60 minutes for emergency locksmith requests. Of course exact timing will depend on your location and traffic conditions. Our mobile locksmith service vans are equipped with the latest in cutting edge locksmith tools and equipment. Our specialised vans means that we are mobilised, flexible and can complete most locksmith jobs on site, right at your location. All of our Eastern Suburbs Locksmiths are fully licensed, insured and experienced in performing all locksmith services and do so with a friendly smile on their face. Sydney’s Eastern Suburbs encompasses the local government areas of: Municipality of Woollahra, Waverley Council, City of Randwick and the City of Botany Bay. Within this whole area there are many homes, apartment blocks, local shops and larger businesses with the largest collections of shops being found in within Bondi Junction and Eastgardens Westfield’s. 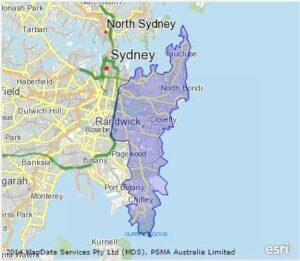 We are proud to service this entire area, helping to increase the security of Sydney’s residents and businesses through our residential and commercial locksmith duties. If your home, business or rental property in Sydney’s Eastern Suburbs is in need of a mobile locksmith, please give us a call. Our services include maintenance, repair, replacement, design and installation of all types of locks and various security devices. From simple internal and external door locks to window locks, garage door locks, sliding door locks, shutters, electronic locks, access control, master key and restricted access keys. We cover it all. Our team are more than happy to provide a no obligation free quote for any locksmith Eastern Suburbs service and can often do so over the phone or via email. To request a quote simply give us a call or complete our quote request form below.